At under £6000 (about $12000 / €8000) – less than half the price of comparable sampling oscilloscopes – the PicoScope 9201 has all the features and performance you need at a price you can afford. 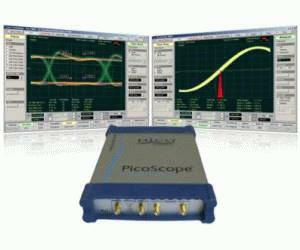 Designed specifically for the complex task of analysing high-speed electrical signals, the PicoScope 9201 is ideal for many advanced applications including: signal analysis, timing analysis, testing and design of high-speed digital communication systems, network analysis, semiconductor testing, and research and development. The 12 GHz PicoScope 9201 sampling oscilloscope will be available June/July 2008.